My time spent in Lido was filled with memories of sand, sun and seabass. On my last night in Venice, I wore this lace dress from H&M with a complimentary Hermes scarf. I was inspired by the stunning yellow tilework on the Ausonia Hungaria Venice hotel. The hotel featured a beautiful garden, fitting the tropical location. The hotel was a beautiful, laidback place to stay in Lido. It had plenty of Floridian charm and was perfectly situated 10 minutes from the beach and only five minutes from the water taxi station. The hotel had a decent breakfast with delicious blood orange juice I’ll always remember! I didn’t check out the spa facilities because we spent so much time at the beach, the only drawback was the lack of (good) restaurants close to the hotel. If you don’t mind a walk, I highly recommend La Tavernetta, a nice Tuscan and seafood restaurant along the beach. They had a beautiful patio, great wine and the servers were very friendly. We shared a large whole fish, a seabass, that was so flavourful and fresh. For starters, my boyfriend had some of the best mussels of his life! I’m allergic to seafood, but I was tempted to try some of the mussels with massive fruit… they looked like they were plucked out of the Adriatic sea this morning. They were in season, but the servers were very helpful in selecting the perfect seasonal seafood. On the way to the restaurant, we passed by some Lido “landmark” hotels, villas and Film Fest venues. I can only imagine the crowds and excitement at this gorgeous island during the Venice Film Fest! It would be a dream to attend the festival, but I will still dream of my time at this beautiful island, that even inspired people likes of Coco Chanel. 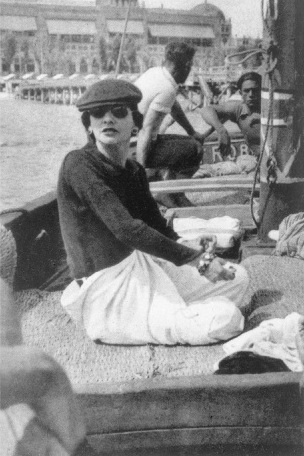 Chanel visited the Lido, and wore bell-bottomed pants to get in and out of gondolas easier, which sparked the revolution of pants in woman’s wardrobes. Chanel also started using Venice’s lion as her symbol, (also tied to her Leo astrological sign) which is now a symbol synonymous with the house of Chanel. More recently, Karl Lagerfeld, current creative director of the Chanel house showed a collection on the Venice Lido in 2010. Steeped in fashion history and nautical influences, Lido is a wonderful place to getaway from the tourist crowds of Venice… and a laidback place to spend a day at the beach.